Stamford’s Megan Landsiedel (2) of Stamford defends against Wilbur Cross’ Dejah Middleton on Thursday. 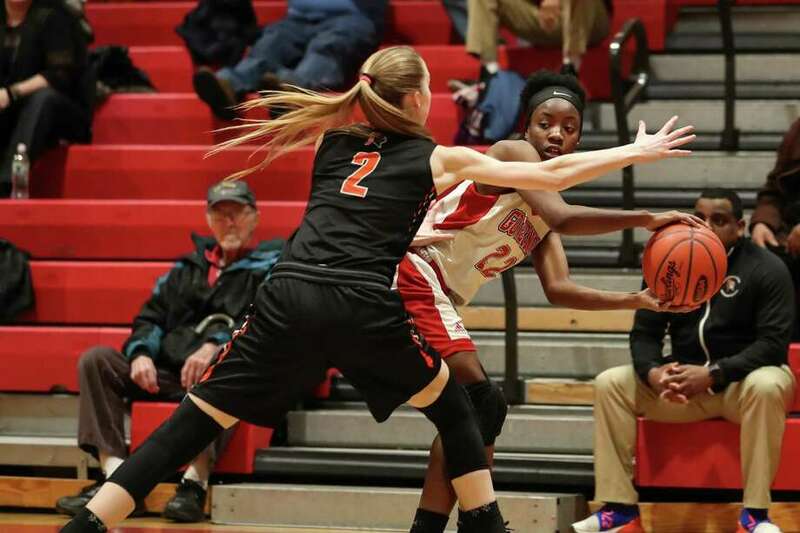 Wilbur Cross (20-6), seeded 11th, knocked out 19th-seeded Stamford Thursday night, 45-37, at the Robert Saulsbury Gymnasium in the quarterfinals of the CIAC Class LL tournament. The Governors will play second-seeded New London in the semifinals Monday night at a site and time to be determined. New London defeated Newington 48-35 Thursday night. The first half was a little sloppy for a tournament quarterfinal. Both teams missed a bunch of layups, while Wilbur Cross didn’t help its cause with a 7-for-17 performance at the free throw line. The Governors raced out to a 10-6 lead late in the first quarter, but Stamford’s Megan Landsiedel (13 points) hit a pair of 3-pointers to close out the period to give the Black Knights a 15-10 edge. Landsiedel canned a jumper to start the second quarter that gave Stamford its largest lead of the night, 17-10, but April Artis (10 points) closed it to 17-14 with a pair of free throws just over a minute later. Stamford retained that lead until the final 33 seconds of the half. Wilbur Cross closed it to one, 23-22, on a trey by Mykayla White. And the Governors had a chance to take the lead into the break, but an Artis layup was whistled off when she was called for charging with 21.4 seconds remaining. At halftime, Thomas elected to switch to a triangle-and-two defense to bottle up Landsiedel and Dina Merone (12 points), who had combined for 16 points in the first half. In the second half, they scored just nine. After that, Stamford no longer could get its guards open shots. Meanwhile, Wilbur Cross took the lead back for the first time in over 11 minutes when Anaija Ricks hit a three-pointer to give the Governors a 28-26 edge with 5:57 to play in the third quarter. Baskets by Tyannah Tucker and Artis gave Wilbur Cross its biggest lead of the night, 34-28, at the end of the quarter. While Stamford remained cold from the field, the Governors extended their lead to 38-30 on an Artis bucket with 4:16 to play in the game. “Rebounding and defense wins championships at this time of the year,” said Thomas. Still, the Black Knights closed it to 38-35 with 3:30 remaining after Landsiedel completed a conventional three-point play and Tashea Nelson hit a layup. After that, it became a question of whether Wilbur Cross could hit its free throws to close out the game. The Governors were able to do so, while Stamford only scored 14 points in the second half. Stamford’s season came to an end at 14-9 after the Black Knights reached the quarterfinals thanks to a pair of upsets over higher-seeded teams in Fairfield Ludlowe and Trumbull.